My latest favourite vintage store is Cheltenham's own, 'Malone's Vintage' an online retailer where you are guaranteed to find quality vintage clothing at a reasonable price. Launched in 2013 by Missy Malone, a lady who describes herself as a "long time lover of vintage fashion." Missy has a BA (hons) in Costume Design and when she is not discovering vintage gems, works as a touring showgirl. Malone's Vintage specialises in mid century fashion 1940's-60's and hand picked designer pieces. There is something for everyone to love, from womenswear, menswear and accessories! 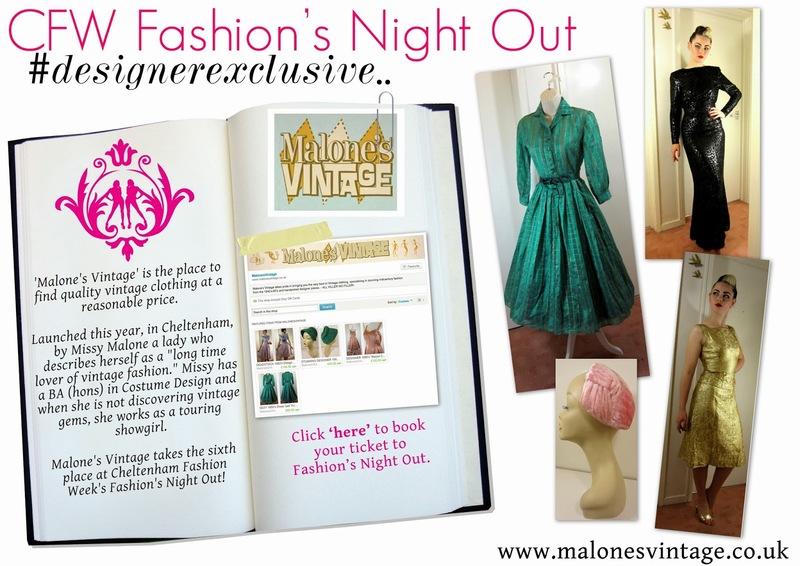 Malone's Vintage takes the sixth place at Cheltenham Fashion Week's Fashion's Night Out!